Sweet, eh? The acknowledged masters of 70s bubblegum pop rock. And yet here they are in Prog. Surely a mistake, right? Absolutely not. Because on their sixth album, the band were shifting into musical areas which had perhaps been off limits to them before. Not that the four had ever been prepared to stand still. They had long taken leaps into a more powerful, aggressive rock style on album tracks, something at odds with their charting singles. Now, in what would prove to be the final release from the classic line-up, Sweet went even further. They brought in psychedelic twists and daubs of progression to augment the melodic nature of the music. It meant that Level Headed was an ambitious project, one that stretched the four-piece’s talents in a way that had never been done previously. They led off by taking the listener on an expected journey, offering only glimpses of what was to come. So, Love Is Like Oxygen, their last big hit, mingled an opaque psychedelic intricacy with an obvious pop rock tune. It’s interesting to note, though, that the album version is a lot longer and has more depth that the edited single. The same can also be said of California Nights and Strong Love, both of which offer the semblance of being prime style Sweet, yet also have a slightly bolder approach. This is developed with Silverbird, which allows itself to get lost in a swirl reminiscent of Jefferson Airplane. But it’s on Anthem No 1 (Lady Of The Lake) and Anthem No II where things really depart from the norm. Here Sweet go for what can only be described as an art rock indulgence, with the articulate guitar work from Andy Scott complemented by classical style keyboard and string sections. It says much of how creative the band could be that it never sounds forced. Self-produced, this album represents Sweet as you’d never heard them before, going for a more introspective and adventurous path. They weren’t prepared to give fans what was perhaps expected, but instead took musical leaps off the edge of the cliff. It would be foolhardy and misleading to suggest the band fully embraced progressive music. But on Level Headed they moved a lot closer to 10cc and Supertramp than anybody might have expected. The album wasn’t a commercial success, but now stands as arguably the most fascinating and challenging release of their career. 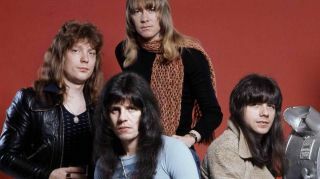 Who knows what might have been achieved if vocalist Brian Connolly hadn’t left in 1979, and this quartet had stayed together. Level Headed shows what potential Sweet had as they deliberately abandoned playing safe.